The Lichen series was borne of a set of experiments trying to capture the essence of the small tufts of powder green moss that cluster on the boughs of wet trees. The experiments slowly shifted in their color palletes, and then in their form and composition, eventually evolving into smalls sets of elongated forms that wrap across and occasionally around steady, watery spaces that supply a base for the energy of each piece. Many of the pieces use humble or muted tones, trying to evoke either a soft grace I see so much in nature, or the interplay of colors, sounds or movement of trees, plants, small fauna in the nature woven through by Berkeley neighborhood. The Euca / Lichen series - a mini-series within the ongoing Lichen set - began when I was living two blocks from Golden Gate Park in San Francisco. Before each painting session I walked five long blocks out and five blocks back through the tunnel of the eucalyptus trees at the entrance of the park, and the soft pinks and powdering blues of the peeling bark are some of my most treasured pallets in nature. I would collect these colors and textures in my mind and carry them with me back to the studio, where I would lay them down in marks on white paper. The series reemerged two years later when I moved to Berkeley and a friend walked me to a eucalyptus grove near my new studio and told me that eucalyptus trees are deathly flammable as the trunks are teeming with wet pockets of oil that will burst and shoot searing oil onto surrounding trees if they catch fire, making whole patches of eucalyptus groves burn down like kindling. This hidden ferocity, buried quietly inside the perfumed trunks colored like soft pastels, felt, for me, poetically in keeping with how I'd been feeling internally when shaping the gentle tones of the abstract pieces. After finishing each series I choose one piece that most closely resembles the original inspiration behind the series, and I keep it. For the Euca / Lichen sub-series - a mini series within the ongoing Lichen series - this was the piece. The muted green and soft pink most accurately recall the milky colors of the Eucalyptus tree's stripping bark, and the winding movement of the pink chalk detail, drawing down into a point at the center-right of the green form, best captures the delicate twist of the scythe-like leaves. This piece, Silt, is the second in the ongoing Euca/Lichen series, a sub-series of the Lichenset. The green base of the piece is a soft green intended to capture the milky, almost powdered hues of the leaves of the eucalyptus trees, and the way the green ink mix sits on the thick-textured paper creates a watery feel of light movement. The tone of the piece's chalk detail is one of the earthiest in the series, a light grey-brown, recalling the warm but muted hue of dried topsoil or silt. The weaving composition of the piece's detail is intended to bring a feeling of movement, or lightness, or even a sense of playfulness when compared to the piece's green base which, while gentle, appears steady and resolute. The Lichen series was borne of a set of experiments trying to capture the essence of the small tufts of powder green moss that cluster on the boughs of wet trees. The experiments slowly shifted colors, and then grew into elongated forms that now wrap across and occasionally around steady, watery spaces that supply a base for the energy of each piece. This piece has the most vivid 'base' hue in the series thus far, creating a bright, playful ground from which the creamy-yellow lichen shapes humbly grow. The piece is part departure, part growth, though as part of the genesis of the series stands alone in its move towards capturing the more vibrant tones in nature: the bright emerald glow from a budding leaf after a fresh rain. Continuing from Root to Rise, this piece - the fourth in the ongoing series - pushes the boundaries of color by pulling from the most vibrant hues found in the natural world. The pink chalk detailing against the blue-green ink base recalls the color coupling of the Euca / Lichen sub-series, though in this piece the colors are electrified, intended to be a striking departure from the surrounding series, which invokes nature's more muted palette. There's an experimental element here in not quite closing the south tip of the airy form created by the piece's pink chalk detailing. In this piece, unlike much of the series the grounding shape, here a soft yellow, holds equal energy to the lichen-inspired detailing. The focus is central, the colors both humble and equally muted, and the delicate interplay of colors and composition is meant to recall the grace of nature when it is at its most romantic; perhaps early morning, perhaps not, certainly under soft sunlight that is filtered lightly by a morning cloud. This piece is inspired by the cyclical balance of nature, the harmony and symbiosis between all things, illustrated in part by the complimentary warmth of the humble colors, and in part by the way the not-quite-closed southern tip of the powder blue chalk detailing aligns lightly with the weighty bottom of the not-quite-pink ink mass. The piece is intended to evoke a soft movement - not as striking or frantic as some other from the series - and the blue detailing segments are consequently thick and languorous. Peel draws directly from the muted, pastel tones of the eucalyptus trees. An echoing refrain throughout the series is the love I have for the colors of the peeling bark of the eucalyptus trees, the soft blues and pinks and grays against the dusty mellow green of the fragrant leaves. This imagery is repeated because the trees are so prevalent in my surrounding environment and, for me, symbolize so much of the Northern California flora. 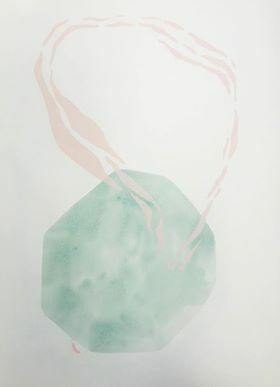 This piece was created early in the series after a walk for inspiration in Golden Gate Park, and the pairing of the warm pink with the mottled green is one of my favorites from the series. One of the most unabashedly blue pieces of the series, I was experimenting slightly with moving towards the gentle curving of water in the piece's pale blue chalk detailing. The detailed lichen-inspired abstract shapes are intended to depict soft movement, an almost-cyclical flowing of one entity around and into the next. Continuing on from Wet/Went, this piece - Tributary - similarly brings together a mix of inspiration from the rounded shapes of soft tufts of lichen, the green of the forest, and the gentle movement of water. The green here is inspired directly by the soft green leaves of the eucalyptus tree, which seem from a distance to be coated with a fine white powder. This theme runs through many of the pieces of the sub-series. It's the element of inspiration I've had most trouble bringing back into the studio (the pale green and the illusion of soft dust are so elusive) but it's a visual concept I find so striking that I continue to try. In Dust, using mixed inks, I came close. The piece is intended to evoke a soft movement - not as striking or frantic as some other from the series - and the blue detailing segments are therefore thick and languorous. One of the most active pieces in the series, the elements of chalk detailing in Breath are more angular and varied in size than much of the rest of the series. With this piece, I was trying to experiment with the weight of the composition; the pink ink underpainting is bright and large, with several sharp corners, and really holds weight in the composition (whereas in many other pieces the ink forms are more of a backdrop). Similarly, I weighted thick, heavy chalk forms in the center of the piece, with a few think slivers, barely touching, at the top. By doing this I hoped to give the piece a strong character and a depth of voice.